SoundScience unveils Qb wireless portable speakers | What Hi-Fi? SoundScience - fresh from winning an Award for its new Frankenspiel FS1 desktop speakers - has unveiled plans for a new wireless audio range. 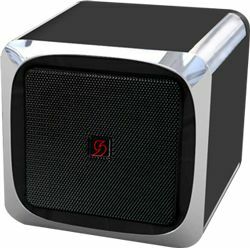 The Qb Series kicks off with two Bluetooth speaker options - the battery-powered Qb-M and USB-powered Qb-Dual (pictured above) - with SoundScience planning to add more advanced wireless options, including speakers and headphones, in 2012. SoundScience CEO, David Archer, explained: "Portable speakers have to be small, light and cut free from the power plug. They should be stripped down, no controls, with all the money going to sound quality." The Qb-M (pictured right) is a single battery-powered speaker designed to play audio from any Bluetooth-equipped device, including smartphones and tablets. SoundScience claims its battery will last up to 30 hours between charges. The Qb-Dual is a pair of speakers that draws its power from your computer's USB socket, and can playback audio that way or wirelessly via Bluetooth. Both Qb Series speakers come with carry cases, chargers and the ability to be firmware upgraded - including the additoinal of new sound profiles - via micro USB. The SoundScience Qb-M and Qb-Dual speakers will be available shortly, priced £50 and £100 respectively. Next up for SoundScience is the Qhb, a desktop USB power hub both designed to offer additional USB connectivity to your computer, plus fast-charging of all your portable devices AND a power boost for your SoundScience USB speakers. David Archer claims the Qhb will offer 30 percent more power to the Frankenspiel FS1 speakers, allowing them to be played at considerably higher volumes. The Qhb USB power hub will be available by the end of the year, priced £60. Despite launching new Bluetooth speakers, SoundScience doesn't believe the wireless technology offers high-enough sound quality, so it plans to launch an advanced wireless range - including speakers and headphones - in 2012. The new wireless products will use the Wi-Fi Direct standard – already supported by a wide range of devices, including Samsung and LG smartphones. The standard, which enables suitably equipped devices to wirelessly link together directly, without the need for a wi-fi network, allows for transmission of uncompressed audio. "It'll mean much better audio quality than Bluetooth," says David Archer, whom claims SoundScience will be first to market with a Wi-Fi Direct audio product. He adds that the company's forthcoming wireless headphones - also supporting uncompressed audio via Wi-Fi Direct - will weigh under 90g and have a battery life of at least 24 hours. "No-one else is getting close to that," he claims. Full details of the new SoundScience Wi-Fi Direct speakers and headphones will be announced at CES in January 2012. We hope to review the new products as soon as they become available.